Amazon buys Whole Foods, and almost overnight it adds about 500 stores alongside its online marketplace. And for years, Amazon has been gradually opening physical bookstores in cities across the country. So competitors are headed back to the online battlefield, scrambling to offer delivery options. Walmart has spent billions trying to buy its way into the delivery game. It has acquired delivery and online retail companies like Jet, Parcel, Flipkart, Shoebuy, Cornershop — the list goes on and on. In the Bay Area, you might have recently seen billboards for Shipt. Target bought the delivery company a year ago and is currently rolling out same-day shipping all over California. Shipt said the goal isn’t to compete with Amazon and woo away the online giant’s customers. Julie Coop, Shipt’s communications director, said the goal is to get more people to order online and to expand the pie of potential customers. 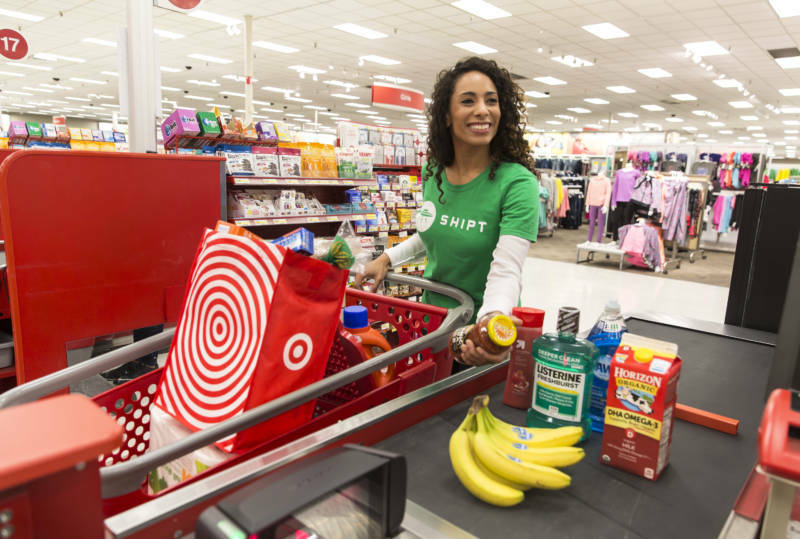 With Shipt, Target is looking to cultivate more customers like Rose Petroff, an office manager in San Francisco. Like most Americans, she orders some things online, but she does a majority of shopping in person. Petroff used to go out and buy all the supplies for her office. Now she has Shipt drop off things like printer paper, and she uses services like DoorDash to deliver lunch. Both companies are powered by contract gig workers, following the Uber model. When Amazon started almost 25 years ago, e-commerce hardly existed. Investors were convinced that delivery was the future of retail, so they were patient as Amazon focused on growth versus profits. This allowed the company to build a massive infrastructure for delivery and condition consumers to order online. For years Amazon has been working to convince everyone that futuristic, super-fast delivery is right around the corner. Five years ago Jeff Bezos, Amazon’s CEO, suggested drones would be delivering packages as early as 2018. This kind of marketing has retailers frantically trying to figure out how they will compete with things like drone delivery. Business consultant Matt Sargent said everyone is getting a bit ahead of themselves with delivery. “I do think that there’s an overblown fascination with the shift from brick-and-mortar to digital,” he said. “It’s like the flying cars of the 1950s,” Sargent said. It’s now 2018, and the skies are filled with neither flying cars nor fleets of Amazon drones. Sargent said what Amazon has done is condition customers to expect same-day delivery from retailers. Even so, online shopping is still very much in the minority when it comes to retail. Online sales are growing, but they still account for less than 10 percent of all retail. Overblown or not, retailers are afraid of being left behind. More than half now offer same-day delivery, a number that is expected to grow to 65 percent by the end of 2019. While Target and Walmart collectively spend billions to acquire companies that will ship to customers across the country and in the Bay Area, Amazon is doubling down on its physical presence. It just opened a new store in San Francisco, and its bookstores are filled with people shopping, not receiving things via flying drones.